The Walter Camp Football Foundation has announced the Football Bowl Subdivision National Offensive and Defensive Players of the Week, presented by Generation UCAN, for games ending October 15. Carlos Henderson had 12 catches for 326 yards and five touchdowns as Louisiana Tech defeated Massachusetts, 56-28. The 326 receiving yards were the second-most in school history. Henderson had scoring receptions of 50, 42, 5, 83 and 6 yards as the Bulldogs improved to 4-3. Notes: Carlos Henderson is the first Louisiana Tech player to earn Walter Camp National Player of the Week honors since the award began in 2004. 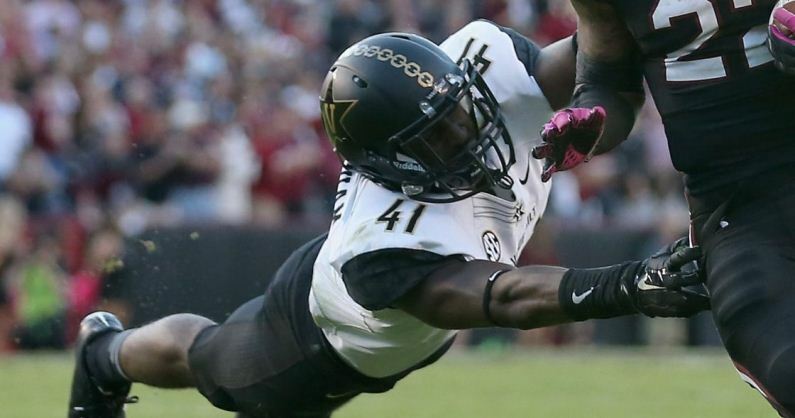 Zach Cunningham had a career-high 19 tackles (6 solo), including 2.5 tackles for losses and one pass break-up as Vanderbilt rallied for a 17-16 victory over SEC-rival Georgia. Cunningham, who made a game-clinching tackle in the final minutes, led a Commodore defense that held Georgia to just 75 yards rushing in the contest. Notes: Zach Cunningham is the third Vanderbilt player to earn Walter Camp National Player of the Week honors, joining former Commodores Ryan Hamilton (DB, Sept. 28, 2008) and D.J. Moore (DB, Nov. 16, 2008).